Felida is a small town based in Clark County Washington with a land area of just 2.89 square miles. Its 7,385 residents enjoy the scenic beauty of the Lake River and proximity to the city of Vancouver WA. The town is not only a bedroom community but is also close to the Oregon border. 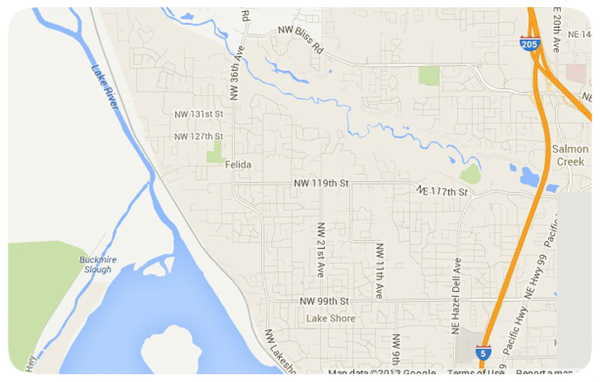 Interstate 5 takes commuters through Vancouver WA and North Portland in minutes. The town is situated east of the Shillapoo Wildlife Recreational area, south of Whipple Creek Park, North of Vancouver Lake and west of Salmon Creek. There is an abundance of wildlife and waterways for camping, fishing, hiking and biking in the area. Anyone who enjoys the great outdoors can appreciate this region's natural beauty. The city has dedicated 14 acres for recreation activities, such as soccer fields; which are also used by Salmon Creek Soccer Club. It has two full-size and one mini-mod soccer field. This little town also has basketball courts, trails, playgrounds and picnic shelters for its residents. Home prices in Felida remain stable but as the demand for housing continues things may change. Single family homes continue to attract city dwellers who are looking for a more tranquil lifestyle. Last year the appreciation percentage for homes in this city was 0.79 percent. The average age of the homes in Felida is around 12 years. Around 89.07% of the homes are owned, this includes apartments, mobile homes, occupied rooms and separate living quarters, and 7.21% of these homes are for rent.